Knife amnesty bins have been placed at Aldershot police station and the Rushmoor Borough Council offices in Farnborough as part of the district response to knife crime. The Rushmoor Neighbourhood Policing Team and Rushmoor Borough Council have teamed up to get knives off the streets. The bins have been secured by the entrances of Aldershot police station, in Wellington Avenue, Aldershot and Rushmoor Borough Council, in Farnborough Road, Farnborough, from today (Monday 20 August) to Friday 24 August. Members of the public will be able to dispose of knives and bladed articles without fear of repercussions. 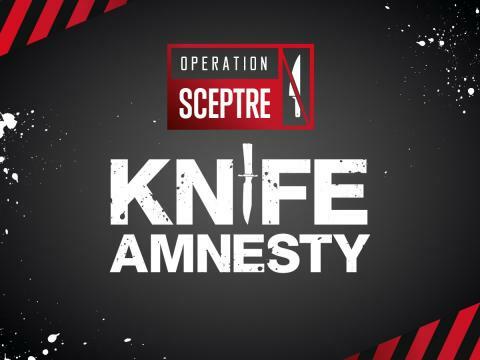 The amnesty is part of Operation Sceptre, an anti-knife campaign through which Hampshire Constabulary is working to take knives off the streets and educate people about the dangers associated with knives. Rushmoor District Inspector Phil Mayne said: “Sadly, like other towns and cities, Aldershot and Farnborough are not immune to knife crime, and often incidents are suspected to be drug-related. “We know that people carry knives for many reasons, including fear or because they think it will protect them. “However, the reality is carrying a knife puts them at greater risk of being seriously injured or killed, or being arrested for possession of a bladed article.